Summary: Will Shea has a plan. He’s managed to hack the system and get himself into the prestigious Connaughton Academy for his senior year of high school. All he has to do is impress his absurdly wealthy classmates with his invented back story about being a scholarship student from a tiny island in the Pacific, enter their social circles and leverage those connections forge this path through those connections to a life of immeasurable influence, power and privilege. Will is determined to leave his rough and tumble life on the streets of Trenton, New Jersey, and his less-than-professional con artist father, behind. But things are not going to be as easy as that, once he collides with Andrea, another Connaughton student/scammer who herself is operating under a falsified identity, aiming at the same life path Will has his eyes set on. Suddenly, the long con is on: The first person to reel in the biggest, richest fish on campus gets to stay at the Academy while the other has to try their unlawful scheming elsewhere. This is a fun and fast-paced story with plenty of twists, turns and fake-outs with elaborate swindles running through the entire story. You’ll be rooting for Will as he finds himself sinking deeper and deeper into his caper as unexpected challenges, including the appearance of his criminal family members and the possibility of a real connection to another Connaughton student, get in the way of his perfect score. Con Academy reads like your favorite school comedy movie and it deserves to find its way on to your list of must-read books. Who will like this book? : Readers who have ever contemplated a life of (non-violent) crime. Anyone looking for a quick, light read with plenty of action and laughter. If you like this, try this: How to Lead a Life of Crime by Kirsten Miller. Zen and the Art of Faking It by Jordan Sonnenblick. Tracers by J.J. Howard. For mature readers, Catch Me If You Can: The Amazing True Story of the Youngest and Most Daring Con Man in the History of Fun and Profit by Frank W. Abagnale and The Lock Artist by Steve Hamilton. Summary: Adolf Eichmann was a decorated Nazi officer and a key figure in the transport of Jews and other ‘undesirable’ populations from Hungary to overcrowded ghettos and eventually to the deadly concentration camps located throughout eastern Europe. He prided himself on his efficiency and the lengths he would go to in convincing that these moves were in the best interest of those who would eventually perish in the Holocaust. After the war was over and Nazi Germany had fallen in 1945, Eichmann disappeared. This is the story of how this wanted man was found, captured half a world away in Argentina and brought to Jerusalem to stand trial for his atrocities 15 years after the end of the war. This gripping page turner delves into the espionage work done by several key players, from ordinary citizens whose lives had been shaped by the horrors of war, stake out artists and military men who could be compromised in an instant, and up to the highest offices in the Israeli government. The seven-year operation had to be completed with absolute secrecy and precision and even though you know the outcome, it reads like the best kind of spy thriller and is a great choice even if you aren’t a fan of non-fiction reading. 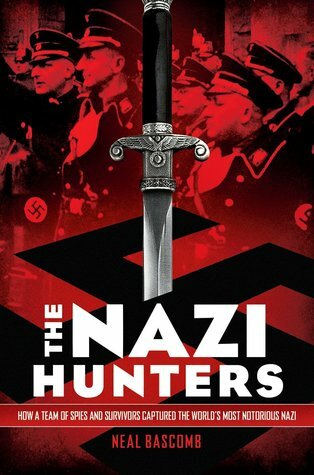 The Nazi Hunters won the 2014 YALSA Award for Excellence in Non-Fiction for Young Adults. Who will like this book: Anyone in interested in World War II or Israeli history. Readers who like learning about ‘secret’ or lesser-known stories in history. If you like this, try this: Mature readers should check out Eichmann in Jerusalem by Hannah Arendt. Eichmann in My Hands by Peter Malkin, a key figure in The Nazi Hunters. Summary: Most fathers share favorite pastimes with their sons. Using time on the ball field or fixing things around the house as a way to build a relationship and pass on important life skills. But when your Dad is one of the world’s most infamous serial killers, father-son bonding takes on a gruesome aspect. For Jasper (Jazz) Dent childhood was a time spent learning how to become the perfect serial killer. Ever since Jazz can remember, his father groomed him to take over the family business of killing. He has witnessed crimes that would turn the stomachs of experienced cops and understands a crime scene the way a cop never will- from the eyes of criminal. When Jazz’s father is caught and put away for life, Jazz thinks that way of life is over. He wants nothing more than to sink into normalcy. But when a killer strikes in his sleepy hometown of Lobo’s Nod, Jazz realizes he may hold the key to ending the rampage. Who better to catch a killer than someone who has been trained to think like one? The only problem is Jazz is beginning to wonder if he may truly become his father’s son and take up where dear old dad left off. Who will like this book? : Fans of horror and fast-paced thrillers will love seeing the world through the eye’s of a complex character like Jazz. Despite the creepy premise, this book is written with humor and overarching themes of friendship and even romance. Fans of the show Dexter will also enjoy the storyline of a young boy being taught how to get away with murder and the demons with which he wrestles to properly channel those urges. If you like this, try this: Hold Me Closer, Necromancer by Lish McBride or Anna Dressed in Blood by Kendare Blake. For a more serious, historical story about teens trained as assassins try Grave Mercy: His Fair Assassin by Robin La Fevers. Summary: Seventeen-year-old Benson Fisher thinks his life is finally about to change. The scholarship to Maxfield Academy is his ticket out of the foster care system he bounced around in since the age of five. Maxfield was to be his means of escape, but now he would give anything to escape Maxfield. Because Maxfield isn’t like the place he saw on the website or what he was promised by the director, Ms. Vaughn, in the three-hour drive from the Albuquerque airport to the school’s remote location. Instead, Maxfield is a school surrounded by unclimbable fencing and video cameras that monitor your every more. A place where no adults are seen, but rules are strictly enforced and breaking one can have deadly consequences. In order to survive and maintain a certain level of peace, students have developed three groups: Society, Havoc, and Variant. Each group has specific jobs around the campus and certain beliefs with respect to life at Maxfield. Everyone must join a group, but does that mean Benson has to buy into the beliefs of his group? Benson is desperate to escape the school and when he discovers the real secret behind Maxfield he thinks he may have found the means to accomplish it. Now he just needs to figure out who he can trust because escaping this prision-like school is not going to be a one-man job. Who will like this? : Fans of fast-paced thrillers/adventures will be surprised and intrigued with sci-fi kick near the end. If you like this, try this: The Maze Runner by James Dashner, The Compound by S.A. Bodeen, Lockdown: Escape from Furnance by Alexander Gordon Smith.